Defrizzer Solution suitable for blond or bleached hair. 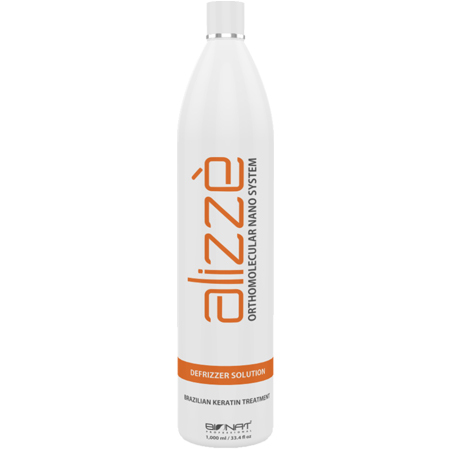 The Alizzè Orthomolecular Nano System Color Treated Defrizzer Solution restores amino acids and vitamins of the hair fiber, leaving the hair loose, disciplined and with smooth aspect. Promotes uniformity of color, giving platinum effect to natural blond, colored and/or discolored. Your hair will gain natural smoothness, uniform color, incredible shine and absolute control frizz, for a longer period. It is a safe product, easy to use and lingering. In order to gain international credibility, the product has been tested by Intertek laboratory, one of the leading US laboratories. Wash the hair with Alizzè Orthomolecular Nano System Demineralizing Shampoo. Dry fully with the blowdryer. Divide the hair into how many parts necessary. With the help of brush, apply the Alizzè Orthomolecular Nano System Color Treated Defrizer Solution. Avoid touching the scalp, spreading evenly to the ends with both hands. If necessary, use a comb gently to distribute the product. Place the plastic rings to preserve moisture and heat the hair. Let stand for 40 minutes or 20 minutes under the heat source. Fully remove hair product with water only. Dry 70% with the blow dryer and brush as well. Use a flat iron with maximum temperature of 450F ° / 190C ° (Always apply a heat shield before use the flat iron) into thin strands, slowly until it is completely dry, lined and shiny. In order to gain international credibility, the product has been tested and certified by Intertek laboratory, one of the leading US laboratories. Apply the shampoo on wet hair to the scalp. Gently massage the scalp, to allow penetration of the product. Let stand for 3/4 minutes and then rinse with warm water. The Alizzè Orthomolecular Nano System Defrizzer Solution restores amino acids and vitamins of the hair fiber, leaving the hair loose, disciplined and smooth. Promotes the realignment and seal the cuticle surrounding the wire, leaving the most disciplined hair easy to comb and with reduced volume. Your hair will gain a natural smooth aspect, an amazing brightness and absolute control frizz, for a longer period. It is a safe product, easy to use and long lasting. On dry hair, divide it into how many parts necessary. With the help of brush, apply the Alizzè Orthomolecular Nano System Defrizzer Solution. Avoid touching the scalp, spreading evenly to the ends with both hands. If necessary, use a comb gently to distribute the product. Place the plastic rings to preserve moisture and heat the hair. Use a flat iron with maximum temperature of 450 F° / 190 C° (Always apply a heat shield before use the flat iron) into thin strands, slowly until it is completely dry, lined and shiny. 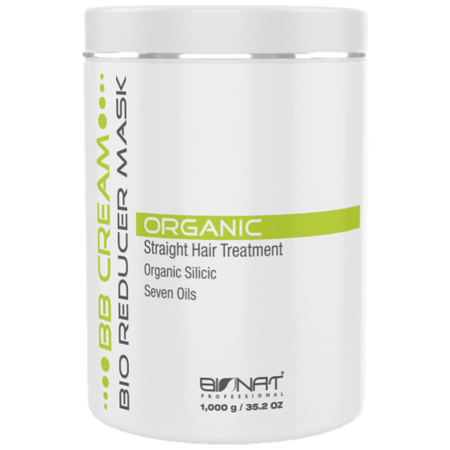 Mask for hair realignment, correction and nutrition. 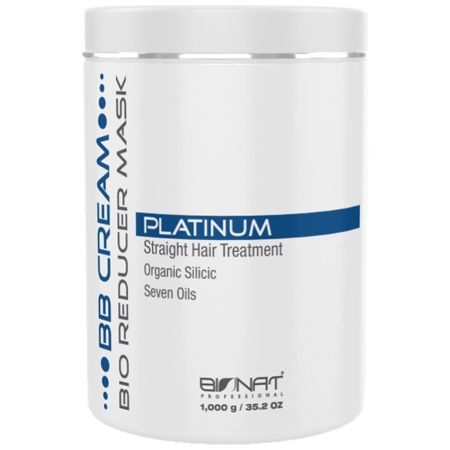 It is a treatment and volume reduction for restructuring and realigns the hair fiber. Our technology combines the properties of organic acids cosmetic ingredients rich in protein to provide gloss and smoothness, eliminating frizz and leaving them smooth and naturally hydrated for long. With the help of brush, apply the BB Cream Bio Reducer Mask Organic. Avoid touching the scalp, spreading evenly to the ends with both hands. If necessary, use a comb gently to distribute the product. Place the plastic rings to preserve moisture and heat the hair. Dry 70% with the aid of a blow dryer and brush as well. Use a flatiron with maximum temperature of 450F ° / 190C ° (Always apply a heat shield before use the flat iron) into thin strands, slowly until it is completely dry, lined and shiny. Warning: On damaged, sensible and low porosity hair apply P&N Gloss Protector before start to flat iron the hair with a temperature not higher than 374 ºF (190 ºC). Mask for hair realignment and correction of warm color tone as orange and reddish, for hair with color that need more nutrition. It is a treatment and volume reduction for restructuring and realigns the hair fiber. Our technology combines the properties of organic acids cosmetic ingredients rich in protein to provide gloss and smoothness, eliminating frizz and leaving them smooth and naturally hydrated for long. With the help of brush, apply the BB Cream Bio Reducer Mask Platinum. Avoid touching the scalp, spreading evenly to the ends with both hands. If necessary, use a comb gently to distribute the product. Place the plastic rings to preserve moisture and heat the hair. Use a flatiron with maximum temperature of 450 F° / 190 C° (Always apply a heat shield before use the flat iron) into thin strands, slowly until it is completely dry, lined and shiny. Warning: On damaged, sensible and low porosity hair apply P&N Gloss Protector before start to flat iron the hair with a temperature not higher than 374ºF (190º C).